← Where's JUnit for C++? GIT is a distributed version control system – that means it doesn't require to have any central repository. It's possible to build system by exchanging commits between equal nodes. It's convenient, however, to mark one repository as the central one. Of course you can change your decision at any time. I'll show you how to do that. If you created your repo copy by "clone" operation you will have "origin" remote branch defined. This remote can be used to pull/push changes. That's all. Much simpler than moving Subversion repository. 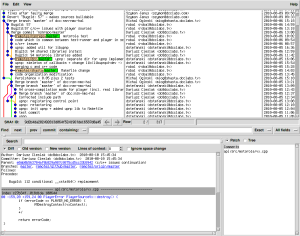 UPDATE 2011-12-09: replaced sed command with much simpler "git config" replacement. This entry was posted in en and tagged git, vcs. Bookmark the permalink. What is the sed command doing? I can't quite read it. sed edit-in-place does the same job. will set the URL of the remote named “example” to git://github.com/user/test.git. We were using the personal git account of an employee to hold our repositories, but that employee has left. I forked the repositories, and now need to change our local repositories to pull and push from the forked versions. Should I be using the "remote set-url" command, or going through the steps that you describe? Looks like your method is MUCH simpler than mine. It does the same job (changes URL of a remote location). I think it's relatively new. Having tried it without success and then found instructions elsewhere, I think that the two config lines should be branch.master.remote and branch.master.merge rather than just master.remote and master.merge. Worked first time! Thanks for sharing. Thanks! This is just what I needed to switch the origin of my Homebrew install to my own fork without having to wipe the Homebrew folder and install again. Thanks, I was able to switch the origin and push changes to my own fork & branch without losing any changes. That did the job entirely. Might want to mention you will need to fetch when you have finished changing origin master. Worked for me after some fiddling with the proxy, http://stackoverflow.com/questions/3512202/github-https-access helped out here. Yes, very helpful! Thank you! !